Going out camping is one of the best ways to become one with nature and also appreciate the natural environment. It also allows us break the monotony of being in the same environment for too long. Although it may look like a mundane object, camping lantern is one of the most vital accessories. Without it, you will have a hard time finding your way around, preparing meals, or lighting the inside of your tent. Rechargeable LED camping lanterns are preferred due to their brightness, energy-efficiency, and durability. LED camping lanterns need to be sturdy that will withstand frequent falling, bumping or abrasion from the surrounding. 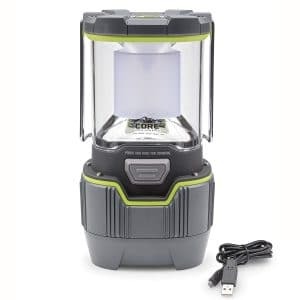 Let’s jump to the top 10 best rechargeable LED camping lanterns as in the following list. 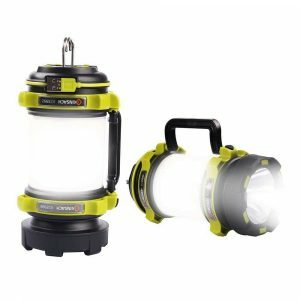 Rated at 1000 lumens, the Core rechargeable camping lantern provides sufficient lighting for your camping needs. The Core lantern is constructed with industry leading CREE LED bulbs that will last the lifetime of the product, and a center optic in the lantern disperses light for a smooth spread of light without a harsh point source. It comes portable design with a folding steel handle design for easy hanging and fold down for storage. You can charge your small eletric devices using the USB output port up to up to 2.5 times. 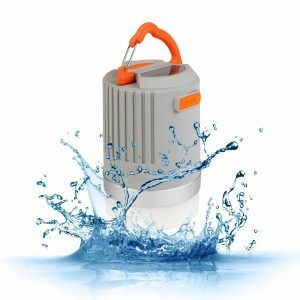 This high-quality LED lantern can withstand a fall onto a dirt surface from up to a meter high and will still function properly after being exposed to rain and water. To help you organized your stuff while camping, a storage at the bottom of the lantern is added to keep the cord hidden. The Bolt Lite camping lantern is meant for the rough outdoors. It comes in a rugged design and is made from strong ABS plastic, and covered with thick, shock-resistant rubber around the edges to withstand water (IPX-6) and shock resistance. 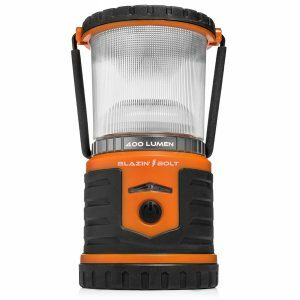 To provide 400 lumens of brightness at a distance of 85 feet, the lantern relies on a high-grade 6000mAh Li-ion battery, which a single charge allows you to use up to 250 hours. 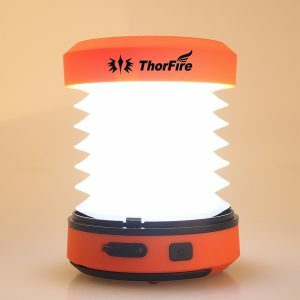 The ThorFire rechargeable LED camping lantern is very popular among people looking for simplicity and efficiency. It comes in a hand crank design that enables you to recharge it by simply turning the handle. Nonetheless, you can also charge it via a 5-volt USB charger. Weighing approximately 5.9 oz, it can easily fit on your pocket or backpack, and is easy to hold with your hands. It comes with two brightness ratings: 125LM for very bright and 30LM for medium bright. Included in the pack are 1 ThorFire CL01 Lantern, 1 Micro/ DC USB Charging Cable, and 1 User Manual. The Blazin’ Bison rechargeable LED lantern is a portable lantern that is definetely suitable for camping and related outdoor activities. The lantern comes with 6 lighting modes with 360 degree coverage. This camping lanter is very versatile, which it is water resistant and drop-proof from up to five feet. A hook is attached a the bottom of the lantern for hanging while needed. 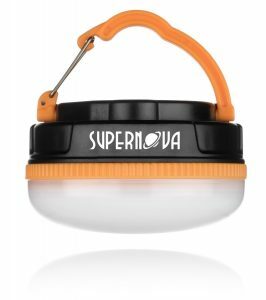 Producing 180 lumens of ultra bright light is the Supernova Halo LED rechargeable camping lantern. It is very compact thanks to being made from plastic molding and sturdy rubber. Apart from giving it sturdiness, the material also protects the unit from dust, moisture and water. The built-in LEDs have a lifespan of 100, 000 hours and this guarantees you of long-lasting service. The magnetic-bottom and clip ensures the bright lantern can be fixed anywhere. Other than lighting, it is also ideal for emergencies since it also features slow-pulse indicators. 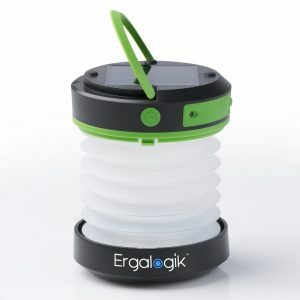 Offering more than 10 hours of lighting, quick charging and 3 lighting modes make the Ergalogik lantern to be featured on the 10 best rechargeable LED camping lanterns review. The well-built product is designed for outdoor use (camping, hiking, and fishing, trekking…) and comes in a small but compact size. When fully charged, you will get not less than 10 hours of lighting and can also choose your preferred light intensity. The highest is 65 lumens; the lowest is 25 lumens while there is also the SOS mode for emergencies. The lantern also features an 800mAh power bank that allows you to charge other accessories via USB cable. The NULIPAM rechargeable LED lantern is a good choice for camping, backpacking, hiking, trekking and other outdoor activities. It features a water resistant outer shell (IPX4) that safeguards the unit against falls and the rugged terrain. 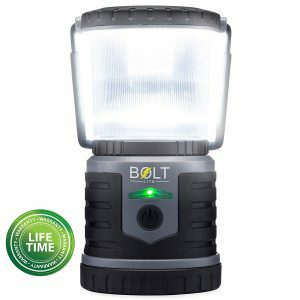 With a fully charge of 3-4 hours, it can last for 2.5 hours to as a 360° all-around lantern or for 4.5 hours limited to 180°, dimmer side light for 16 hours and about 7 hours for head light. It also features USB power output for charging your other devices when needed. It’s highly-portable thanks to its light weight, two hanging hooks and side foldable handle. Providing 440 Lumens, the BESTON camping lantern is among the brightest in the market. It features a special material on its lenses that make the light more natural as well as soft. The heavy-duty accessory is mainly made from ABS material that is both waterproof (IP65) and dust proof. For good grip and comfort, it is coated with revolutionary rubber. It’s also very light (70x106mm) and also convenient (300g) and features a retractable hook for easy hanging. Courtesy of the simple power button, you can easily choose any of the 4 Light Modes: High, Medium, Low and SOS (Flashing Strobe). 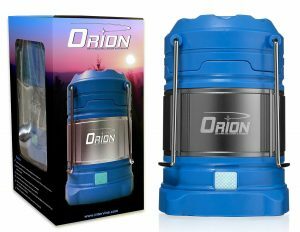 Supernova Orion is said to be among the brightest, versatile and dependable products for camping, fishing, recreation, hiking, biking, caving and more. The use of multi-power technology allows the product to run on a range of power sources. The camping lantern features four lighting modes (Ultra Bright, Bright, Red, and Flashing Red) which can easily be selected via the press of a button. Courtesy of the built-in 5200mAh power bank, the lantern allows you to charge other accessories such as tablets, smart phones and more. The Tough Light camping lantern takes the first runners position. Made from Military-grade rubber and plastic molds with built in rubber O-rings, provides IPX-6 water resistance to handle wet conditions, which can handle a drop from 5 feet with no damage. The Tough Light has 6 optional lighting modes and offers very bright light (40 lumens) using very low energy consumption. On full charge, expect to receive up to 200 hours of lighting. 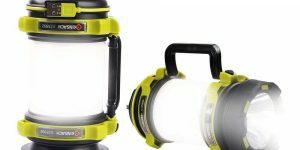 You can also charge your phone or computer with the lantern that is suitable for camping, hiking, fishing, biking, other outdoor activities and emergencies. There you go, the best rechargeable LED lanterns that will make your camping, hiking or any other outdoor expedition more satisfying. They all consist of built-in LEDs that are known for being light, efficient and durable. With the rugged design, you don’t need to worry about your lantern losing its functionality or looks too soon. 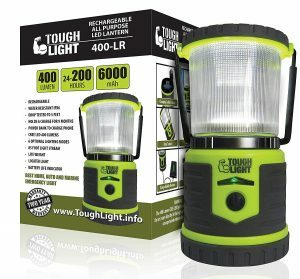 Another good camping lantern brand I found is roadeavour. Great list!